Having released the now classic and much sought after “Chelsea 77” single on United Artists in 1977, the Maniacs soon imploded. Now, some 42 years later, the band’s second single is about to hit the public. It features two absolute killer punk tunes, both unreleased in any form until now. 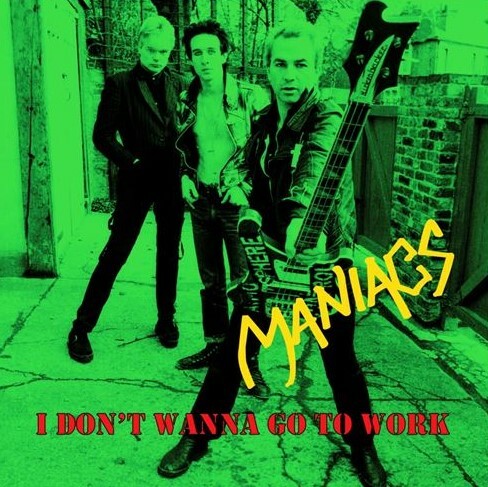 The track on the A side, “I Don't Wanna Go To Work”, was recorded by the Maniacs in 1977 to feature in a punk rock short film called Punk Kebab. This song shows the band as it was, Raw, Raucous and Snotty in those heady and glorious days of the 1977's UK Punk Rock Explosion. This is nothing but a true lost punk nugget that will now finally see the light of day. The B side track, “White Light/White Heat”, is a live recording of the Velvet Underground classic. It dates back to 1976 when Alan Lee Shaw’s (guitar/vocals) love of simple stripped down brash in-your-face rock and roll of the MC5, Stooges, New York Dolls and the Velvet Underground prompted him and his fellow Maniacs to seek their fortune on the club/pub rock circuit in a 1976 London that was still badly infected with the ponderous overblown navel gazing progrock. Enjoy!